Armwrestlers from all over the country had gathered in Bangalore to showcase their strength at the URPA World Ranking Series on Sunday, 17th March. The event was organized by Bulldog Armwrestling in association with Professional Armwrestling League (PAL). 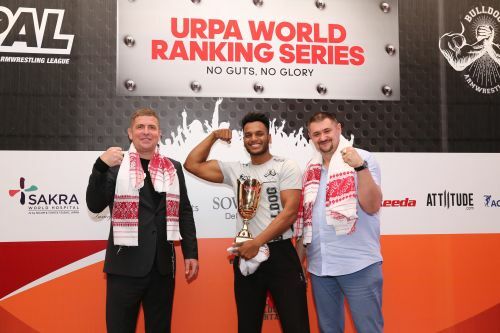 It was a first of a kind event to be held in India, giving a platform to the arwrestlers to get their name in the world's first mathematically calculated rankings, the Unified Rating of Professional Armwrestling (URPA). The event saw participation of more than 65 male and female armwrestlers, who participated in eight weight categories each in right and left arm competitions. Participants from Assam dominated the competition, winning in eight categories and taking home the most number of trophies. Manoj Debnath won the first prize in men's 63 kg category in both right and left arm competition, while Pranjit Saikia and Debjit Sarma won in the 86 kg and 105 kg categories. At the end of the competition, winners from all the eight categories were pinned against each other to decide the Champion of the Champions. With yet another enthralling final between Pranjit Saikia and Debajit Sarma, it was a battle to watch for. Saikia defeated Sarma and was crowned as the Champion of the Champions of India. Speaking to Sportskeeda after his win, Saika expressed his happiness and said, "My success is no accident. I have achieved this feat only due to my hard work, perseverance, learning, sacrifice and most of all, because I love what I am doing. I am young and hungry to reach the top. I dedicate this Trophy to Bulldog Armwrestling and to all those who supported me." He added, "It was a great experience to be a part of India's first URPA World Ranking event, supported by Professional Armwrestling League (PAL). Arm wrestling is the future. Bulldog is the future of Arm wrestling in India!" Saika will now represent India at the 4th Premier 101 Armwrestling Competition in April (Kuching, Malaysia) and Zloty Tur in November. In the women's matches, Maharashtra's Lisa Roselyn Dias won in the 65 kg left arm category, while Poornima Yadav Sheoran of Delhi won in 65 kg right arm category. Assam's Dharatri Koch was announced as the winner in 52 kg right arm event. Igor Mazurenko, President of PAL and Kirill Yakovlev, Director of Communications of PAL were the chief guests for the event. Igor also hosted a seminar for the participants a day before, explaining about the arm wrestling styles and tactics, training programs for the armwrestlers and the benefits of the Unified Rating of Professional Armwrestling. Kirill Yakovlev spoke to Sportskeeda about the event that was happening for the first time in India and expressed his excitement to see participation in such big numbers. He said, "India is a major market to grow armwrestling, majorly because of the enthusiasm of the professional athletes and a long history of the sport in the country. Today's event is an iconic one towards the history of professional armwrestling in India. The participants of this event will be there in the global ranking in a few days and will compete with the athletes around the world." With India having no certified referees for arm wrestling and the really poor state of umpiring in the current arm wrestling events, a seminar for Indian referees was also conducted by the organizers. Malaysia's Zil Fadli, the head referee of PAL taught the referees the basic of umpiring in arm wrestling. Three referees were also certified by PAL and URPA at the event, making them eligible to stand in any URPA event in India. Bulldog Armwrestling, who have been promoting armwrestling in India for a long time now, played a key role in organizing the event and getting the sponsors on board. Ronnie Sehgal of Bulldog Armwrestling spoke at the event and said, "The participants are excited and overwhelmed to be at the event as many of them have gotten a platform to show their skills on such a big stage." Talking about how many more events the organization is planning to conduct in the near future, Sehgal said that there could be as many as six more such events to be held by the end of December 2019.